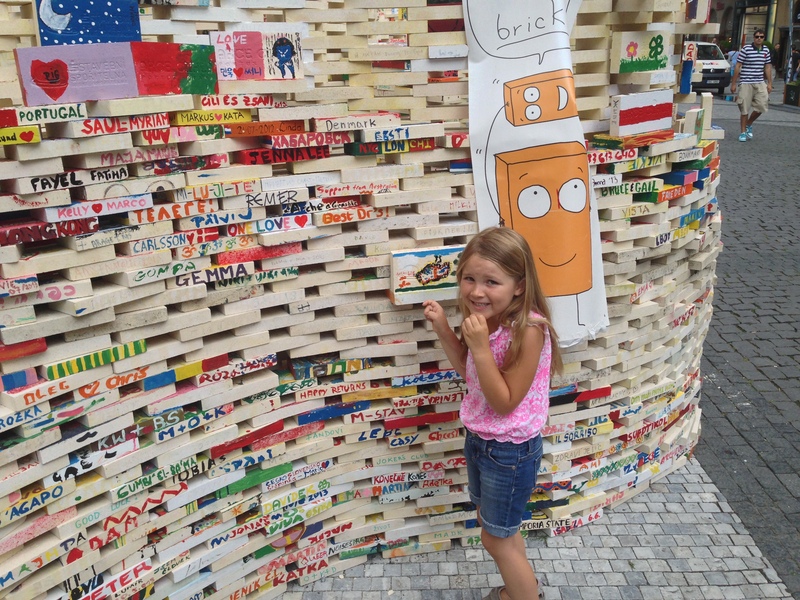 We spent a wonderful five days in Prague, in which I rediscovered a city I’d first become acquainted with in college and Zara discovered Chicken Joe. 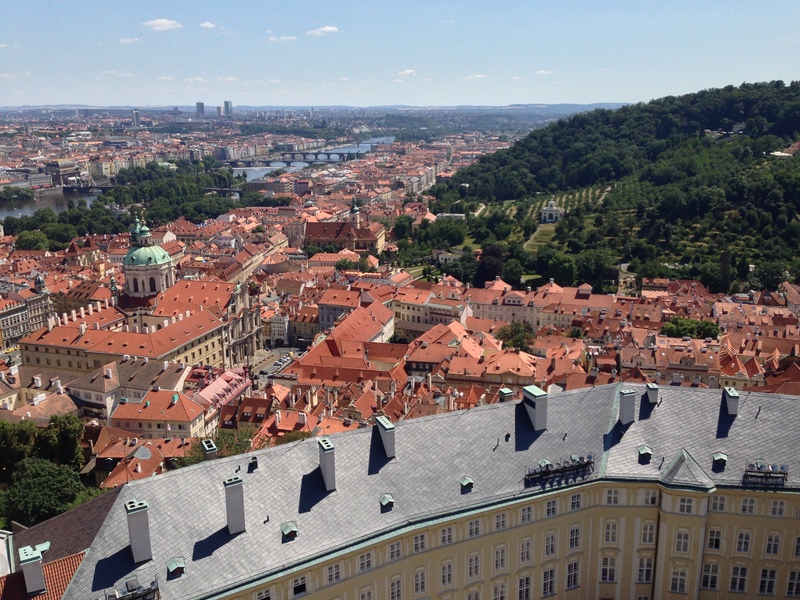 I turned 21 in Prague, exactly half my lifetime ago, in an apartment rented for three days, an act that felt so decadent in the decades before Airbnb. I still remember it cost only $20/night for 2 bedrooms and a full kitchen. 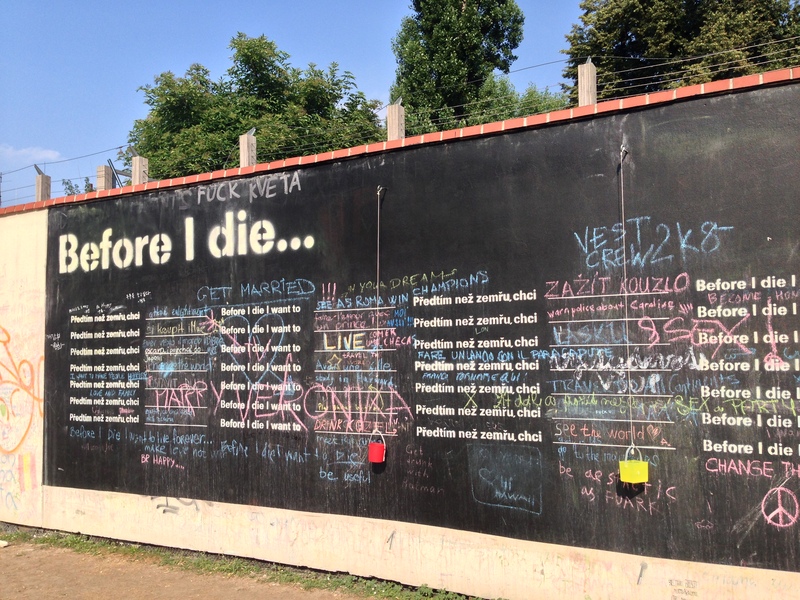 In 1992, only three years after the Velvet Revolution, Prague was still emerging onto the global travel scene. Returning after two decades, I was relieved to see that although it has long since transformed into a tourist mecca, it hasn’t lost its ability to enchant. There are more street performers, kitschy museums, tourist restaurants offering mediocre fare and crowds (and a hotel room is 10x what it was on my first visit), but its red rooftops, cobbled streets, fascinating history, gorgeous architecture and music make it a place where I could easily imagine staying. 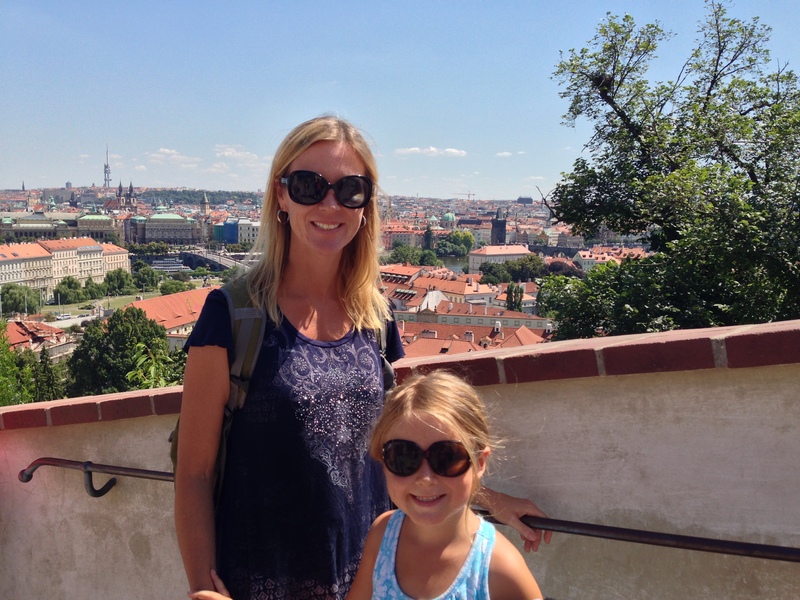 We’d originally booked only three nights in Prague, but extended for two more days. 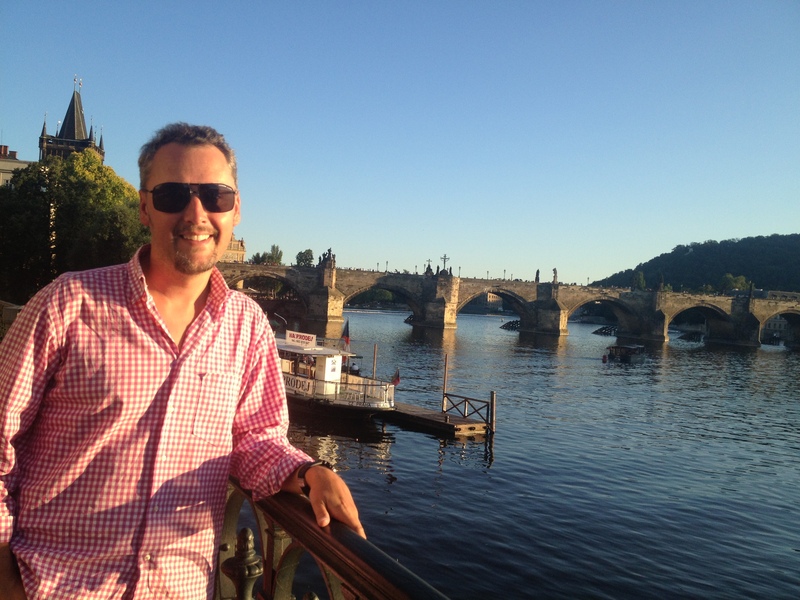 The first night we soaked in the views as the sun set over the Charles Bridge with drinks at one of the several restaurants now sitting on the banks of the Vltava River. The setting was perfect and something I could have happily done every evening. 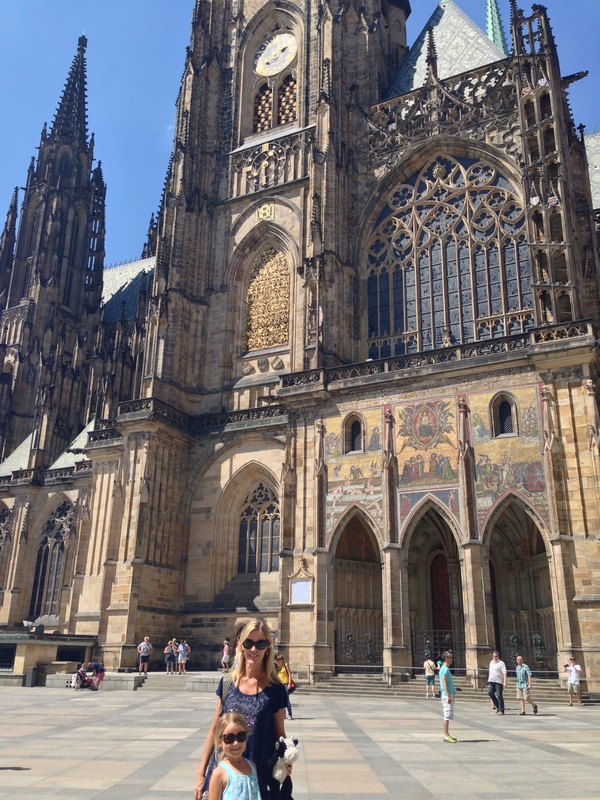 We spent another day exploring Prague Castle, an impressive complex set on a hill across the river looking back over the city. The views are magnificent from almost anywhere on the grounds, but seeking out even a better bird’s eye view, we climbed to the top of the Bell Tower. 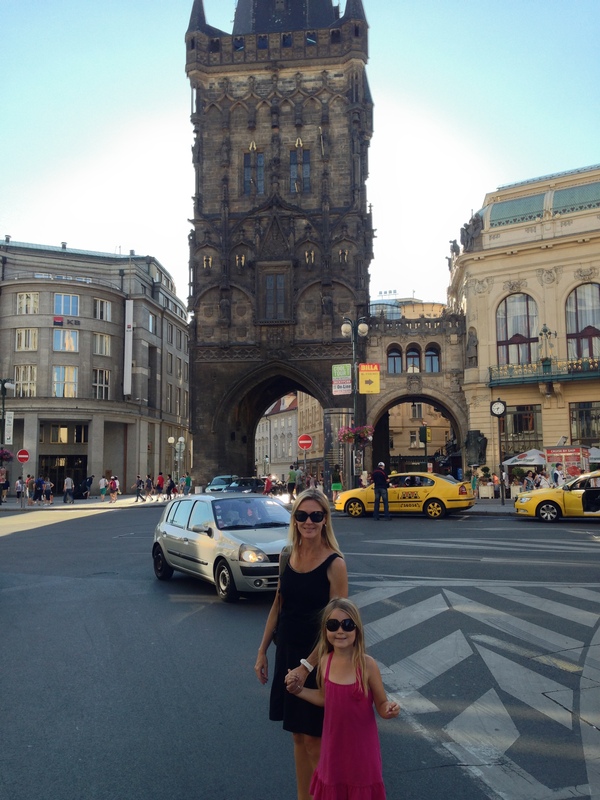 The tower houses Prague’s largest bell, named Zikmund, and legend has it that the bell breaking portends bad news. 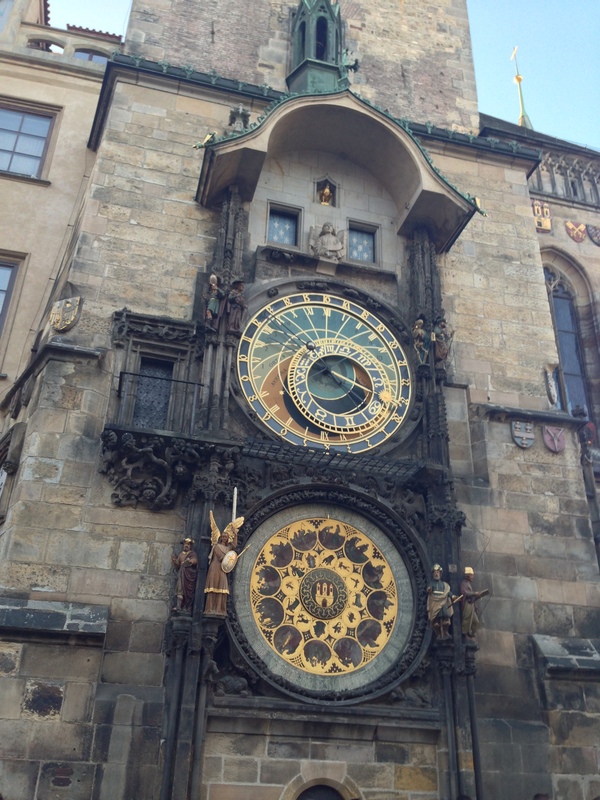 (The most recent example of this was in 2002, when the bell broke and Prague suffered its worst flooding ever.) Zara concluded that this was just a coincidence. Franz Kafka Museum: An oddly affecting museum, its dimly-lit rooms presumably are designed to evoke Kafka’s depression and personal struggles. At times, however, it was too dark to even read the exhibit explanations. Not sure if that was be design or due to burnt out bulbs! Not the most kiddy-friendly place to visit, however. The Chocolate Museum: Just because…it was a toss up between this and the adjacent Torture Museum. The Toy Museum: We have a 6-year old… But, this would also be a must for Barbie fans (and a must-not for those who think Barbie is evil). The Globe: Feeling a bit burnt out by the crowds and the heat, we passed a very relaxing afternoon at this bookstore/cafe. 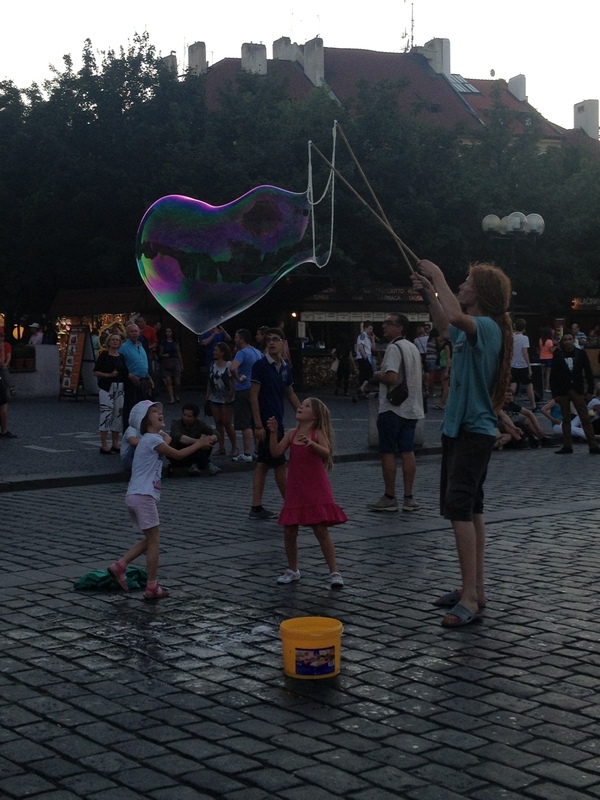 It’s been a fixture on the Prague expat scene since opening in 1993 and I can see why. With its delicious Western fare, a full bar, tasty coffee, pleasant courtyard and strong wifi, its easy to wile away the hours here. While Zara devoured countless books in the kiddie section, we enjoyed some much needed peace and quiet. 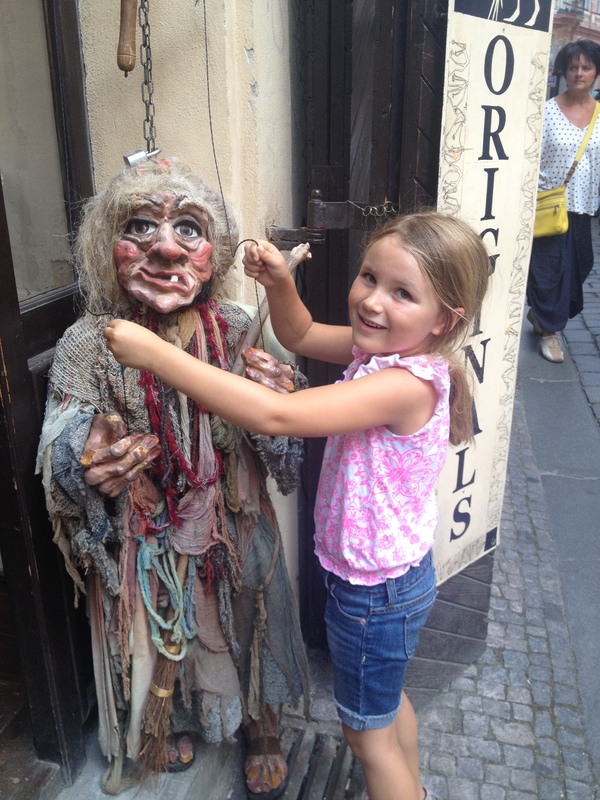 We’ve been moving at too fast a pace since arriving in Europe mid-June–we all are feeling it. 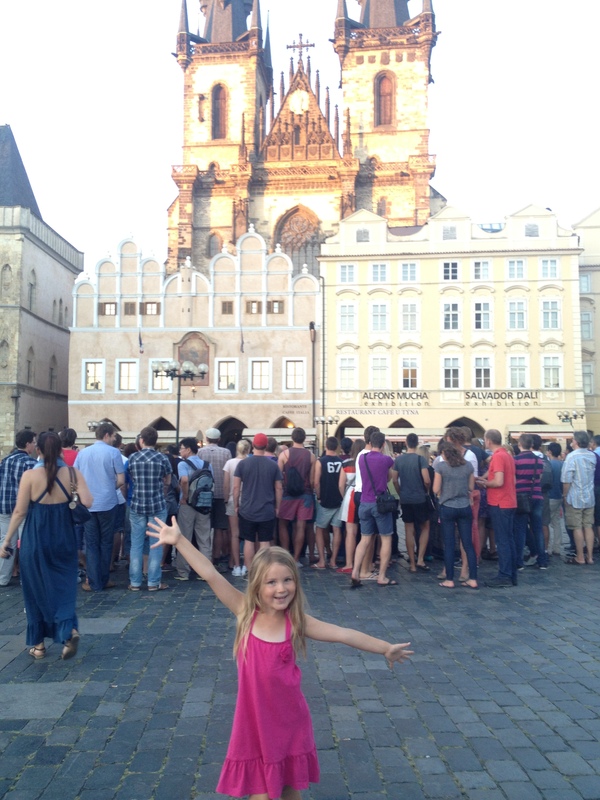 Mozart’s Requiem: We enjoyed a lovely performance of one of Jonathan’s favorite musical pieces at St. Nicholas Church off the Old Town Square. The city lives and breathes music and if we’d had more time, there were countless other concerts on offer. 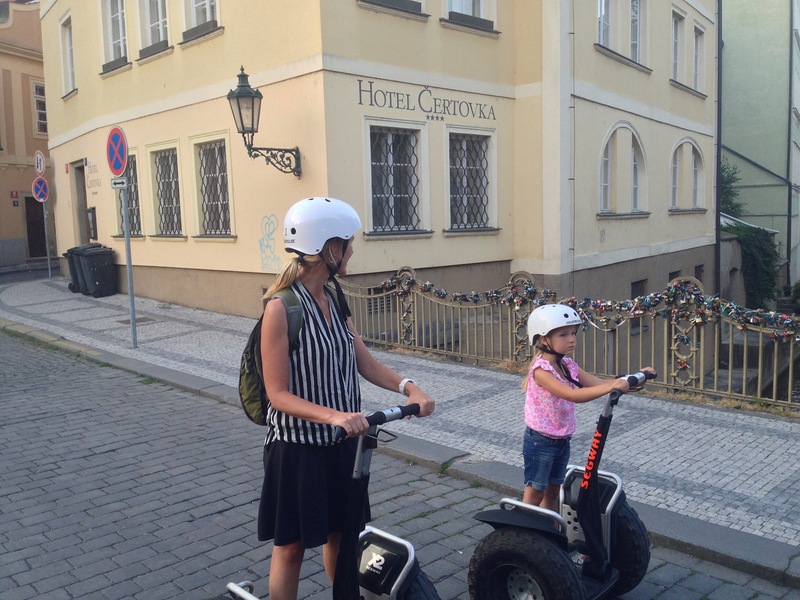 Segway: One of the highlights of our time in Prague happened the last evening. We’d been on our way to dinner and the next thing we knew we were on Segways when they informed us that Zara was old enough. (In comparison, one of SF’s Segway tour companies requires kids to be at least 12 years old and 100 pounds and requires all riders to take a 45-50 minute on board training session, watch a 9 minute safety video and wear reflective safety vest. My impression is that the Czech Republic doesn’t share the US lawsuit culture!) 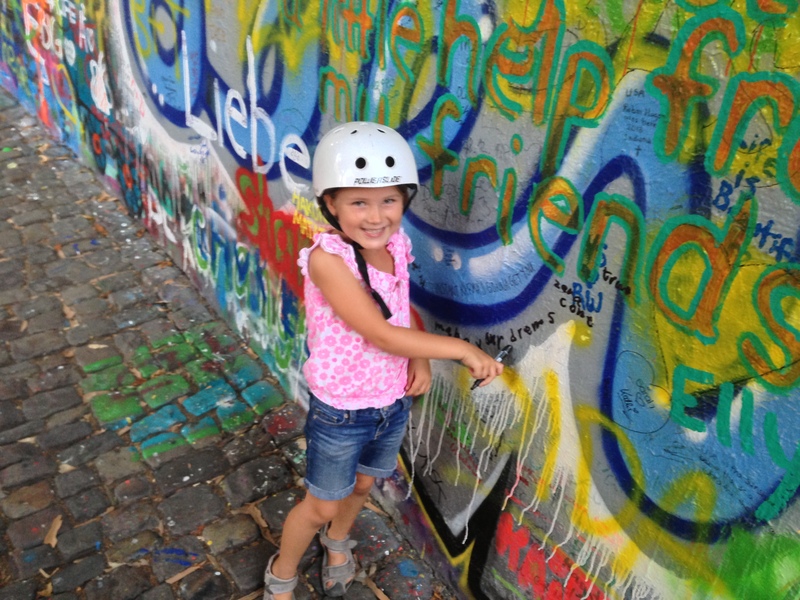 Zara took to the Segway immediately, leaving me in the dust, and our tour guide, Ondřej, was wonderfully fun and informative and took us through neighborhoods we had previously missed, including past the John Lennon Wall, where Zara wrote her own message of peace. And because we are always on the hunt for tasty Indian fare (especially after an involuntary hiatus for several weeks in Italy), we were thrilled to discover Indian Jewel, a lovely restaurant with seating in a small courtyard in the Old Town. We went back for seconds two nights later (and overheard another touring English family mentioning how they were there for the 5th time)! It’s a relief to know that some curry lovers are even more fanatical than we are. Still, there was a lot we left unexplored…another excuse for a visit! And you may be wondering about this Chicken Joe? He’s a Belfast-born street performer whose act includes reclining on a bunch of crushed beer bottles while an audience member stands on top of him and he makes off-color jokes. 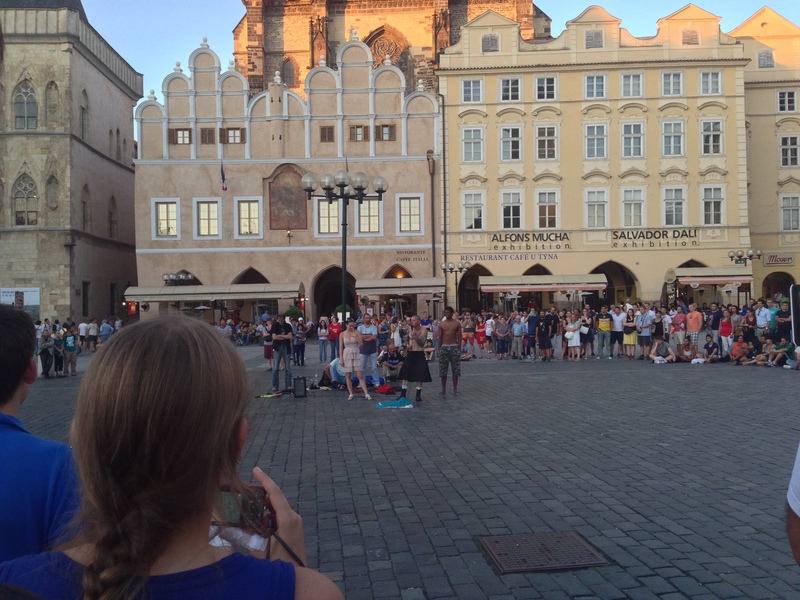 He made quite an impression on our 6-year old who insisted on watching his performance in the Old Town Square at least five times…travel, the best education.